On his 13th carry against Wyoming in 1983, Mike Rozier became Nebraska’s all-time rushing leader. The carry was good for 12 yards, increasing his career total to 2,819 yards. Isaiah Hipp had held the school career record, with 2,814 yards. The carry also produced the second of four Rozier touchdowns that afternoon, as the No. 1-ranked Cornhuskers overwhelmed Wyoming 56-20 at Memorial Stadium. Rozier carried only six times in the second half and finished with 191 yards. Afterward, teammate Irving Fryar suggested calling Rozier “Michael Heisman.” After all, Rozier was going to win the Heisman Trophy, said Fryar, like Rozier from New Jersey. 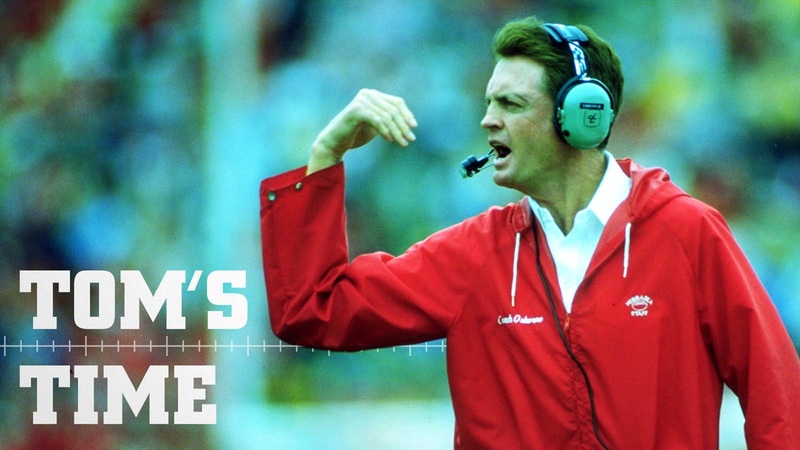 Prior to the season, Coach Tom Osborne had described Fryar, a wingback, and quarterback Turner Gill as also being worthy of Heisman Trophy consideration. In Oklahoma Coach Barry Switzer’s words, they were the “Triplets,” the key figures in Nebraska’s “Scoring Explosion” offense. Fryar and Gill also had productive afternoons against Wyoming. Fryar caught six passes for 96 yards and a touchdown and carried twice for 15 yards. Gill completed 9-of-13 passes for 186 yards and a touchdown, without an interception, and carried three times for 21 yards. Even so, Osborne was disappointed in the Huskers’ play during the second half. They were outscored 17-14, after building a 42-3 halftime lead. His team might have lost “perspective” in the wake of a 44-6 season-opening victory against defending national champion Penn State in the Kickoff Classic. Penn State probably wasn’t a national power in 1983, Osborne said. Strongside linebacker Mark Daum said the Huskers might have been complacent in the second half. The junior from Dix, Nebraska, who had walked on and earned a starting job, was hardly complacent, though. He was credited with a game-high 15 tackles, including one for loss. His brother Mitch was a defensive end for Wyoming, among nine Cowboys from Nebraska, including split end Jay Novacek, who caught six passes for 66 yards and a touchdown. Novacek was from Gothenburg, Nebraska. He and Mitch Daum were starters. Osborne kept plenty of Nebraskans at home, however. Fourteen starters were from in-state, including four-of-five offensive linemen: center Mark Traynowicz (Bellevue), guards Dean Steinkuhler (Burr) and Harry Grimminger (Grand Island) and tackle John Sherlock (Omaha). Steinkuhler played despite learning on Friday his brother Ken had committed suicide that week. Curiously, Wyoming ran 89 plays to Nebraska’s 64 and finished with a time-of-possession advantage of 37:27 to 22:33. The Huskers scored 21 points in the second quarter despite having the ball for only 3:31. Fryar caught a 49-yard touchdown pass from Gill. Rozier scored his second touchdown. And fullback Mark Schellen capped a six-play, 87-yard drive from 1 yard out. Wyoming’s first points came on a 42-yard field goal on the final play of the half. Coach Al Kincaid’s Cowboys, who had opened the season with a 34-13 victory against South Dakota, would finish with a 7-5 record, including 5-3 in the WAC. Nebraska’s next opponent, Minnesota, opened its season with a 21-17 victory at Rice. The Huskers would put their “Scoring Explosion” offense on display a week later in Minneapolis.